The Flagler Trail is a proposed multi-use trail that would run north-south through South Florida. Portions of the Flagler Trail may be parallel to the Florida East Coast (FEC) railway and potential sections will be on the FEC right-of-way, making it a Rail-with-Trail segment. Flagler Trail is part of The Miami Loop which will encompass a 225-mile active transportation route connecting numerous public transportation systems and community destinations throughout South Florida, including employment centers, schools, health-care facilities, parks and open space, beaches, and cultural and civic attractions in the most populous county in Florida. Approximately 54 percent of the network is already complete, and nearly 86 percent of the LOOP’s proposed corridors are publicly owned. Research has found that trails have a real health impact in Miami. In the summer of 2017, Rails-to-Trails Conservancy completed a study that showed a positive correlation between physical activity and health cost savings on The Underline (M-Path) in Miami. Throughout Florida and other states, there have been more than 230 successful rail-with-trail projects. The Flagler Trail has the potential to connect multiple critical neighborhoods to downtown. Friends of Flagler Trail is supported by Rails-to-Trails Conservancy and will support the development of the Flagler Trail. 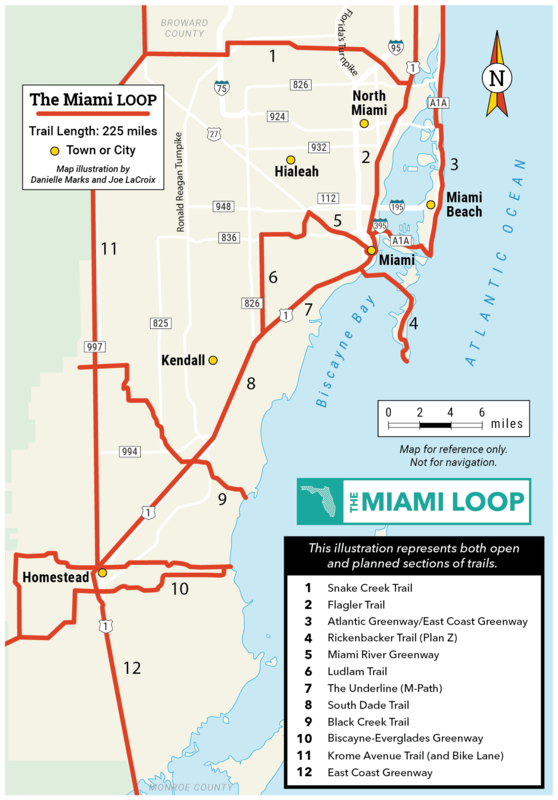 The Miami-Dade County Transportation Planning Organization (TPO) is currently working on a feasibility study for the Flagler Trail to determine potential trail corridors. Even with the increased interest in implementing a Flagler Trail, there has been very little focus on advocacy and building support from the surrounding communities and residents. 133,517 people live within a ¼ mile of FEC corridor but there are only 8.6 miles of existing bike lanes in the area. The impact of the Flagler Trail could be significant, and if implemented with a community focus, it could improve the health and wellbeing of nearby residents. 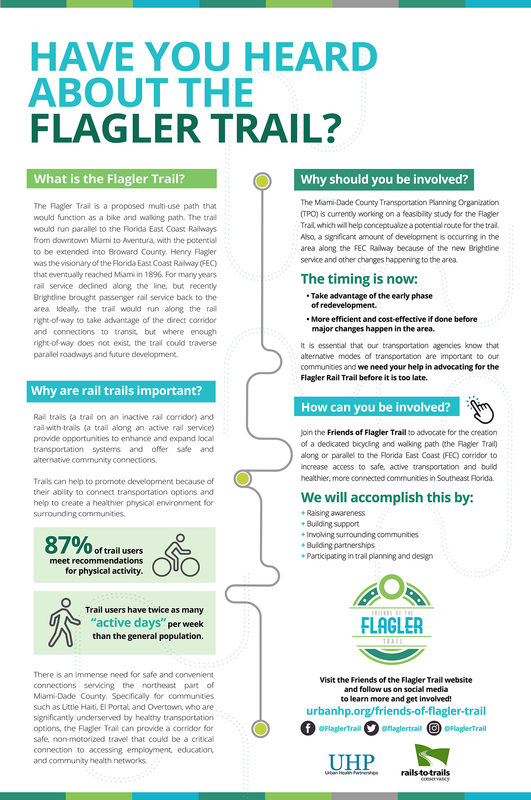 It is critical that the communities along the corridor know the importance and impacts of a Flagler Trail and that the Flagler Trail is incorporated into future improvements to the area as the inevitable development and rail improvements occur. UHP is working on building support and advocacy for the Friends of Flagler Trail. To advocate for the creation of a dedicated bicycling and walking path (the Flagler Trail) along or parallel to the Florida East Coast (FEC) corridor to increase access to safe active transportation and build healthier, more connected communities in Southeast Florida. Friends of Flagler Trail will function in the short-term as an initiative within Urban Health Partnerships, a Florida non-profit. As support for the trail is built and leaders are identified, development of a Steering Committee will be considered. Further growth of the Friends group would aim for the development of an independent organization with its respective Board of Directors. Click to download Fact sheet! 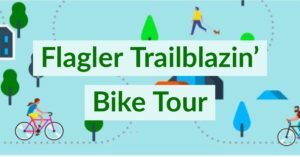 On Sunday January 13, 2019, we’ll explore the new trail in town, The Flagler Trail! The Flagler Trail runs along the old FEC tracks. We’ll go on-road, off-road and explore the neighborhoods north of Downtown to see the great potential of the Flagler Trail. In partnership with the Dade Heritage Trust. This is a themed bike tour exploring urban Miami. Tours start at Dade Heritage Trust HQ at 190 SE 12 Terrace, unless otherwise noted. Get to know the beauty and history of Miami! Free stainless steel water bottle for participants! Join us! RSVP here. 10:00 a.m. – 12:00 p.m. Please contact us at flaglertrail@urbanhs.com should you have any questions.